I am very very very like your site. Thank you for your hard work and excellent collection. With gratitude I share a few links to Russian resources. I hope that someday you’ll come in handy. Sono molto molto molto simile a tuo sito. Grazie per il vostro duro lavoro e la raccolta eccellente. Con gratitudine condivido alcuni link alle risorse russe. Mi auguro che un giorno verrai a portata di mano. Your blog is really interesting too. Can we have links exchange? Thank you. I linked your site. I listed your site in my links. Good luck! I pubblished my conference in your wall facebook too. je souhaiterai savoir où se trouve le tableau de la famille Dormer. I have really enjoyed looking at the art on your site. I am writing down my favorite artists in my sketch book, so that I can refer to them again. You have many that I have never heard of, but whose works are exceptionally beautiful. Thank you for doing this. It is wonderful to have so much beautiful art in one place. It’s kind of you. Thank you very much. “I AM A CHILD” is such an amazing collection – thank you! I’d love to exchange links with you. Being half Swedish (on my dad’s side), I’m so excited to see all your beautiful artwork by Karl Larsson. I’d like to suggest another Swedish artist that you might like: Jenny Nystrom. I was also happy to see you posted about Jessie Wilcox Smith, who I’ve blogged about (http://goodbooksforyoungsouls.blogspot.com/2010/11/jessie-wilcox-smith-magazines-and.html). I love her illustrations for A CHILD’S GARDEN OF VERSES, THE PRINCESS AND THE GOBLIN, and WATER BABIES. Wendy, thank you very much!…First of all: I linked your blog, which is made with great passion. I know, there are many deserving artists that are still missing and many artists to be discovered…Jenny Nystrom is on my “waiting list” and I’ll keep into account the ones you mentioned…I’m glad you mentioned Sweden. I visited Sweden and I can tell that it’s one of best memories I have. Beautiful places to see, beautiful people. In my heart there will always be a place for sweden. Hi! you have a really incredible site! it´s so interesting, and beautiful!! thank you for your hard work, for bring us these pictures… i am doing an study about the children in the art, and your site has been a fantastic help. Maybe, you could put the year and the museum of each painting… Anyway, thank you for your task. I enjoyed it! Thank you, that’s kind of you. ciao volevo comunicarti che questo sito sarà citato come una delle fonti delle immagini che faranno parte della rivista Infanzia di settembre, perché qui ho trovato due immagini di André Edouard Marty. Non trovo un indirizzo mail cui scrivere, ti lascio il messaggio qui e se vuoi maggiori informazioni non esitare a contattarmi all’indirizzo mail che ti lascio. Grazie. Se mi vorrai comunicare l’indirizzo della rivista la segnalerò senz’altro sulla pagina Facebook del mio blog. Ciao. Your site is marvelous. I have spent several happy hours here. What a terrific collection. Thank you, Ellen. That’s kind of you. What a great idea to gather in one space so many artists associated with children! Although, surely, you have your own search methods. Clarissa, gracias!…I’m always open to suggestions. I’ll post the works of these Chilean artists as soon as possible. Thanks again. Saludos desde Italia. Richard, almost 1600 artists have been posted here but, I know, a lot of great painters are still missing. Mabel Lucie Attwell is one of them. I’ll try to remedy as soon as possible. Girl at Fence/La petite fille a la barrière. c. 1939. Oil on canvas on board. 74.6 x 49.5 cm. Private collection. Mother and Child/Mère et enfant. c. 1942. Oil on canvas. 55 x 38 cm. Private collection. Little Girl in Blue/La petite fille en bleu. c. 1934-35. Oil on wood. 73 x 31.4 cm. Kunstmuseum, Berne, Switzerland. Portrait of a Child/La pauvrette. c. 1937. Oil on linoleum. 38.1 x 24 cm. Private collection. Do you think it would be a good idea to include some samples from Maurice Sendak’s work now that he has died? He is possibly the most award-winning creator of pictures of and for children. Thank you for sharing all these wonderful pictures. I’ll try to do something about Sendak as soon as possible. Thanks. First I’d like to congratulate you on your fantastic blog! thank you very much. About permissions: according to the European Union copyright term expires 70 years from the death of the author. After that a painting is in the public domain. Most of the paintings posted here entered the public domain and they are exclusively used to promote art and artists. Things change when you post living artists. Obviously all paintings copyrights belong to them. So when you post these images don’t forget to quote the artist’s name, crediting him for his work. Impressive achievement and I find covering photography with its short history intimidating. 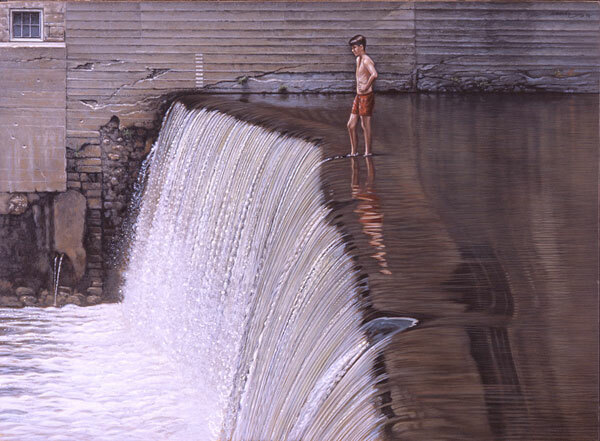 You need to check out two names: Steve Hanks, an American and Jan Saudek, who is Czech. Many people get the impression that Saudek only does photography, but he had used them as templates for his paintings as well and there are a smattering of children. I know them both. 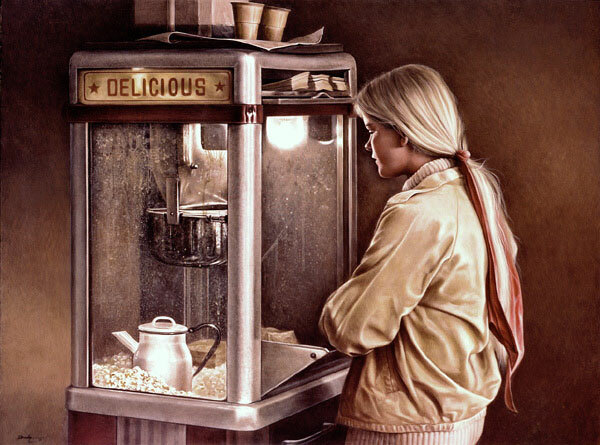 I’ll post Steve Hanks as soon as possible. Regarding Saudek, the decision is more complex. He’s certainly not a conventional artist. I’ve already received criticism for publishing artists like Balthus or Ovenden…There is the risk of being censored or blocked as, unfortunately, it is sufficient that only one follower flags the blog as “inappropriate”. Before publishing artists like Saudek, Stu Mead, Otto Lohmuller, Mike Cockrill…I have to think twice. 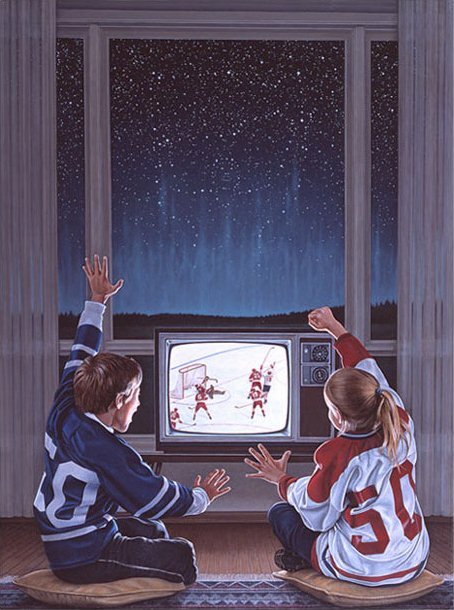 Yes, I agree, Steve Hanks should definitely be added to this website. His watercolors of children are fantastic. Also, what about Robert Vickery since his piece is featured as the logo of this wonderful website. Ooh – I love these pictures! 😀 A stunning blog – looks like a lot of hard work has gone into compiling this collection. I shall be back again! What a wonderful idea for a site! I recognize the painting on your letterhead, but I have forgotten the name of the artist. I know he paints in egg tempera. He was a favorite of mine years ago, and I had a print of a child with a bicycle on a background of pavingstones, which filled the entire picture. I think his first name was Robert. Can you remind me of his name? I just would like to license a photo shown on this website. I want to use it for an article. I don’t have the copyright on the paintings that I post. Most of them are in public domain, others are not. Just know that copyright term expires 70 years from artist’s death. Otherwise all paintings copyrights belong to the artist and you should ask for permission. In any case, always remember to quote the artist’s name. Hey, thnx for your reply. I know it expires after 70 years, but the maker of the photograph has copyrights too. So perhaps you are able to tell me who owns the photograph of the painting of David Artz ‘Mother with Children and Lamb’, then I can ask the owner, since I am afraid the journal will not accept it otherwise. Sorry but no photographer’s name is quoted. When you write, for example, 1920 as a single date, does it mean the birth year of the artist, or the time at which most of the paintings were painted, or something else? Thank you very much for all your conscientious work. Just wondering why you haven’t included the beautiful drawings of Kate Greenaway in your list. There are so many delightful pictures of children by that great Victorian artist. You can also check out Randolph Caldecott. His illustrations for Four and Twenty Blackbirds, Babes in the Wood, etc is worth viewing. I’ll try to post them both as soon as possible. Thanks. Your site is a blessing! This is great! May I suggest you Nicolae Grigorescu. I can see that you have here Nicolae Tonitza and Stefan Luchian. Thank you, Elena! I’ll try to post Grigorescu’s paintings as soon as possible. Great site! One can spend hours perusing through all these great artists! The artist, Alison Burnett, would make a wonderful addition to this site. I think Alison Burnett’s subject matter is horses and not children. Unless there’s another Alison Burnett. There are some wonderful artists on this website and I think it’s a great website. Keep up the great work!! 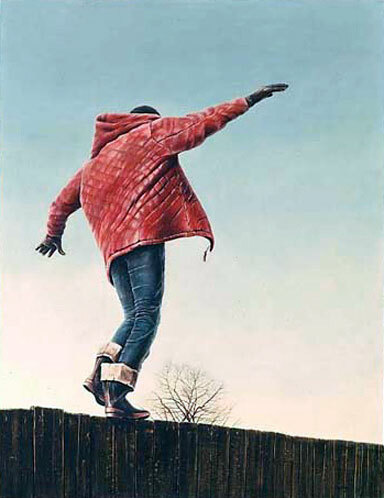 Alison’s earlier works, were paintings of children. She has created some truly beautiful works of art. Thanks for the link! One more thing…..here is a link you can check out. I personally own about 25 children’s portraits painted by a now deceased artist named Raymond Ronyak. He was a WPA artist that painted into his 90’s. At the end of WWII he worked with the Red Cross and the displaced persons program. He met many artists and studied portraiture with them. He painted landscapes, still lifes, and portraits. If you send me your email address, I could sent you photos of some of them if you like. This blog deals with painting, not photography. I just checked your list of artists and I didn’t see Ken Danby’s name. I’m going to include some links for you to check out below. Maybe you will consider adding this wonderful artist to your list. thank you very much! 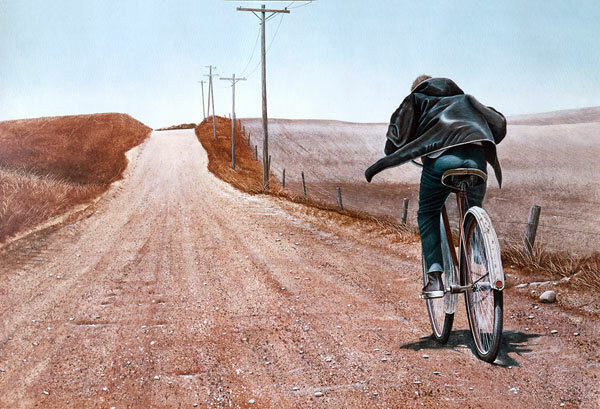 I think I’ll post Ken Danby’s paintings this wednesday. I’ll add them as soon as possible. Thanks! I’ll post them as soon as possible. Thanks. I would like to know,how do you know if a picture is real or a copy? may I use the fishing boys for a digital collage? Which painting are you referring to? Please send all correspondence in English. Why am I the only one with a true face image? The rest are just cartoons. This is me but my hair is much shorter now…..ha ha ha. Great website for art in children Canterville Ghost. Too bad it came to an end. That being said, I’m so pleased that you’ve added Ken Danby and Steve Hanks before you shut down. (rest in peace Ken and Steve). Amen. To gather so much information and pictures was a massive undertaking! It is enjoyed by millions. Include myself please.Thank you very much for doing this. it is one of the best websites in the world. Hello – I have been trying to track down a book from my childhood that you may have scanned some photos from (https://iamachild.wordpress.com/2010/09/02/unsigned/). Do you remember the name and author of the book that the Snow White and Rose Red photos were in? Thank you so much! Mary, the fairy tale “Snow-White and Rose-Red” was written by the Grimm Brothers. The illustrations I scanned were taken from an Italian edition called “Le fiabe più belle” (The Most Beautiful Fairy-Tales), published in 1960 by AMZ Editrice Milano. The book collects five tales and the illustrator’s name is not reported (but I can tell you is the Austrian illustrator Felicitas Kuhn-Klapschy). Beautiful images. Thank you for the site.